The 2018 Ram ProMaster City is a popular cargo and passenger van because it has a wide range of options. 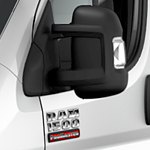 There are limitless opportunities for you to customize the van to fit your specific business needs. For starters, the Best-in-class cargo capacity of the ProMaster City is 131.7 cubic feet. The cargo width is 48.4 inches. The free cargo space gives you the flexibility to tailor the van to precise specifications that you choose. There is even enough room to put down pallets while still maintaining adequate space to accommodate plenty of cargo. The bi-link rear coil suspension is a class-exclusive feature that helps to keep your ride more secure and smooth. You can confidently transport everything that you need, knowing there will be stability to support your valuable supplies. Come by Porterville Chrysler Jeep Dodge to explore the 2018 Ram ProMaster City and take a test drive.